One of the first tasks for President Maithripala Sirisena, after he returned to Sri Lanka from Japan, was to issue an order to immediately rescind instructions sent out by Commanders of the Army, the Navy and the Air Force. They had issued separate instructions that debarred Eastern Province Chief Minister Naseer Ahmed from entering their respective installations. All military personnel were ordered to refrain from attending functions organised by the Chief Minister. The orders from the three commanders came after Chief Minister Naseer Ahmed, casting the dignity of his office aside, insulted a Navy officer at a public ceremony in Sampur (Trincomalee) no sooner he got on the stage. Those on the stage at a Sampur school which came under the Eastern Provincial Council included Eastern Province Governor Austin Fernando and US Ambassador Atul Keshap. The armed forces commanders had taken the decision to send out separate directives after a conference they had with Defence Secretary Karunasena Hettiaratchchi. The proposal to debar the Chief Minister had been made by Navy Commander Vice Admiral Ravi Wijegunaratne. All others had agreed, an official source said. A source close to the Presidency said the order issued by the three service commanders was “totally illegal.” Prime Minister Ranil Wickremesinghe, the source said, had telephoned President Sirisena, who was in Japan, to brief him on the developments. The President had asked the Premier to handle the situation until he returned. This was how the Premier had directed the service commanders not to issue any political statements and await the President’s return. “Only the President can issue a directive to the armed forces to debar a person from entering a military installation. Without his concurrence such a directive cannot be issued,” Prime Minister Wickremesinghe told the Sunday Times. He, however, declined to elaborate. Soon after the directive, Premier Wickremesinghe began receiving inquiries from heads of diplomatic missions and even ministers. The question centred on how disciplined armed forces could take political decisions like that of trade unions. Some even raised issues related to Government’s commitment to democratic principles. The Army, which has the largest number of installations in the country, was instructed on behalf of the Commander, Lt. Gen. Chrisanthe de Silva, by the Military Secretary N.J. Walgama. 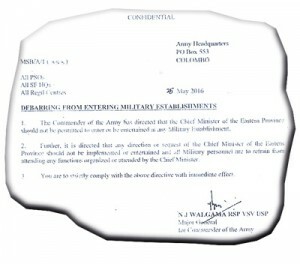 In a May 25 message to all Principal Staff Officers, all Security Force Headquarters and Regimental Centres, he said: “The Commander of the Army has directed that the Chief Minister of the Eastern Province should not be permitted to enter or to be entertained in any Military Establishment. “Further, it is directed that any direction or request of the Chief Minister of the Eastern Province should not be implemented or entertained and all Military personnel are to refrain from attending any functions organised or attended by the Chief Minister. 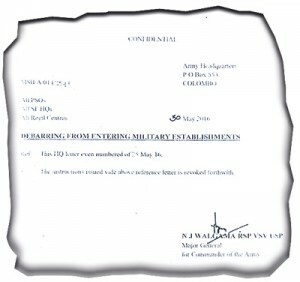 “You are to strictly comply with the above directive with immediate effect.” Similar directives had also been issued by Navy Commander Vice Admiral Wijegunaratne and Air Force Commander Air Marshal Gagan Bulathsinhala. This week Chief Minister Naseer Ahmed was at the Eastern Naval Area Headquarters in Trincomalee for a meeting with Minister Malik Samarawickrema. The Special Crimes Investigation Unit (SCIU) of the Police has uncovered an interesting pattern in a probe it is conducting on malpractices in the award of road construction contracts during the previous administration. Amounts ranging from Rs. 20 million to Rs. 30 million had been paid out to officials in the previous administration. The standard amounts puzzled investigators until one contractor blew the lid. It was 20 percent of the construction cost and those awarded the contract had been told to pay that sum. where such payments to a key individual had been made. Tourism Minister John Ameratunga seems to be developing a penchant for saying wrong things at the right place. If that is his latest drive at promoting Sri Lanka or the UNF Government’s image, it is turning out to be a costly affair. What will he have to say, next? 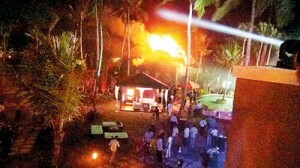 President Maithripala Sirisena was some 50 metres away when fire engulfed straw thatched structures by the poolside of the Shangri La-Hotel which he declared open in Hambantota on Wednesday. His personal security detail hurriedly took him away to the Presidential Suite in the new 300 room hotel. He had a private dinner before departing. Since there were no preparations in place in the event of a fire, the fire detail assigned to the Presidential motorcade had doused it. Now acting Inspector General of Police, S.M. Wickremesinghe has directed the Presidential Security Division (PSD), which he heads, to conduct an investigation to determine whether there were security lapses. Police Chief Pujith Jayasundera is now on a visit to the United States. Investigations are to focus on how the fireworks display came about though President Sirisena had expressed the wish that it should not be held. He was of the view that it was not proper since that very day there were religious rites being conducted in memory of those who died in the landslide in Aranayake. Moreover, he had pointed out that the country was in mourning for the victims of the floods caused by heavy rains and landslides. Thus it was inappropriate to have fireworks. And so, the fireworks display went awfully wrong. A proposal before the Cabinet of Ministers last Tuesday to introduce new Identity Cards has been referred to the ministerial subcommittee on economic affairs. The Capital Gains Tax will come into effect from October 1. It will apply only to those acquiring land or engaging in share transactions, a Government minister said yesterday.